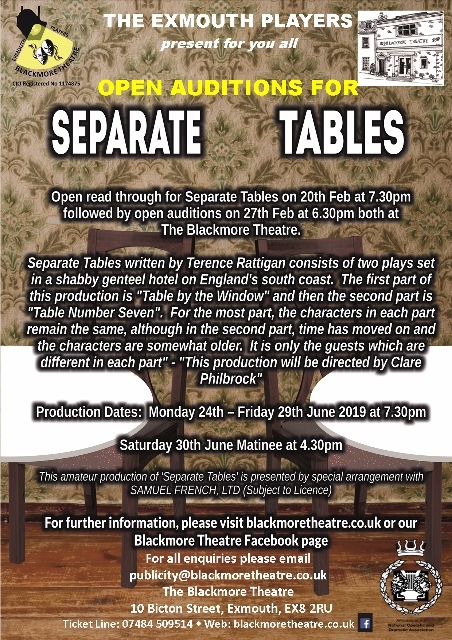 Open Auditions for "Separate Tables"
The Exmouth Players present Open Auditions for “Separate Tables” by Terence Rattigan at 6.30pm on 27th February 2019 at The Blackmore Theatre, Exmouth. It is some 10 years after the end of the Second World War. At the Hotel Beauregard in Bournemouth live a number of individuals whose varied circumstances have brought them to this measured, predictable existence presided over by the resourceful Miss Cooper. Their secrets, triumphs and disappointments provide a distraction from the daily routines of meals in the Dining Room and conversations in the Lounge throughout two separate but closely linked plays, which take place some months apart. In ‘Table by the Window’, the arrival of a former wife and in ‘Table Number Seven’ revelations concerning a Court case make waves for the permanent residents and guests, as well as Miss Cooper herself, in this otherwise sleepy coastal haven. • Saturday 30th June - Matinee Performance at 4.30pm. This amateur production of "Separate Tables" is presented by special arrangement with SAMUEL FRENCH, LTD (Subject to Licence). For full information concerning this production including details of the characters, please click here or visit our Blackmore Theatre Facebook page. Please contact us at publicity@blackmoretheatre.co.uk to register your interest in these auditions, leaving your name and contact details.